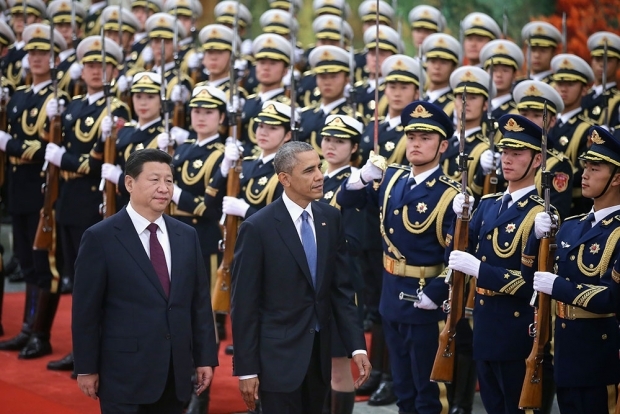 Presidents Xi Jinping and Barack Obama in Beijing, November 12, 2014. In recent years, a noticeable change has occurred in China-U.S. relations. The “problem areas” where the two countries tend to clash are increasing in both number and scope, and there has been a greater degree of hostility in judgments about the other side’s strategic intent. Many new points of conflict—political, economic, and security-related—have arisen between the two powers: from the Asian Infrastructure Investment Bank (AIIB) to the Trans-Pacific Partnership, from territorial disputes in the East China Sea to building up reefs in the Spratly Islands, from the crisis in Ukraine to Chinese policy toward North Korea, from the commemoration of the 70th anniversary of the end of World War II to the fear that the U.S. is “pulling the strings” in the Hong Kong protests, and from reports of Chinese hackers attacking American websites to prognostications about China’s “collapse.” As these problems proliferate, the two countries’ complaints about each other are becoming more strident. Foreign policy circles in Washington, D.C. are abuzz with talk of the “China Threat,” and mainstream voices in the U.S. are becoming more and more unfriendly toward China. Reports on China by U.S. think tanks increasingly recommend a tougher stance toward the emerging superpower. The Council on Foreign Relations has advocated a change in the U.S.’s “grand strategy” toward China, calling for a policy of “containment.” Meanwhile, the mainland Chinese media is expressing impatience with the United States, with editorials in the Global Times frequently referring to “American decline” and many people convinced that the U.S. is trying to spark “color revolutions” in Hong Kong and elsewhere. Chinese analysts see the AIIB, which 57 countries, including 17 European nations, have joined as Prospective Founding Members, as a “Chinese victory” in the Sino-American power struggle; and China’s “One Belt, One Road” initiative has been widely trumpeted as a strategic countermeasure to the U.S.’s “rebalance toward Asia.” The contest between these two strategies—“One Belt, One Road” and Asian “rebalancing”—will set the course for the future of the Asia-Pacific region. There are many reasons to be apprehensive about the future of Sino-U.S. relations. The regional strategic competition that has already arisen between the two powers, and the profound skepticism in each nation’s political circles against the other’s strategic intentions, seem to be leading the U.S. and China down a road of ever-intensifying conflict. The curse of “Thucydides’ Trap”—the inevitable, irreconcilable struggle for hegemony between a rising power and a ruling power—appears to be becoming a reality for the United States and China. However, if we take a closer look at the Sino-American relationship, we see that the two nations are cooperating more as well. Barack Obama and Xi Jinping have not had many chances to meet since 2012, but during their June 2013 meeting at the Sunnylands estate in California and their “evening chats” on Yingtai Island in Zhongnanhai during the 2014 APEC summit, the two leaders appeared to trust one another and have a great deal of personal “chemistry.” In 2014, Chinese and American leaders signed two Memoranda of Understanding designed to stabilize the sensitive Sino-U.S. military relationship, expressing commitment at the highest levels of government to increase military transparency and avoid accidental clashes at sea. In a climate accord signed by Xi and Obama the same year, the two nations promised to reduce carbon emissions 25% by 2020, an important step for cooperation on world emissions reductions. Even on the Iran nuclear issue Chinese diplomats expended no small amount of effort, giving ample support in the negotiations that led to Obama’s treaty with Tehran this year. The clearest sign that the U.S. and China can maintain a strategic partnership is the two nations’ North Korea policy. For years, the U.S. had been trying to convince China to exercise its power over North Korea. Since Xi came to power, China’s commitment to denuclearizing the Korean peninsula is stronger than ever before. Giving Pyongyang the political cold shoulder and applying pressures in the economic and energy spheres on North Korea suits the collective interests not only of China and the U.S. but of the entire Asia-Pacific region. Although economic friction between the U.S. and China has not lessened during the Obama years, Obama’s November 2014 announcement that the U.S. would relax its visa policy toward Chinese nationals will increase social exchange and economic interdependence to unprecedented levels. In 2014, Chinese investment in the U.S. went up by over 40%, and now extends to 41 states. On the Taiwan issue, both Beijing and Washington have expressed concern over the possibility that the Democratic Progressive Party candidate, Tsai Ing-wen, could win the Taiwanese presidency in the 2016 elections in January, sparking a new crisis in cross-Strait relations. Washington’s policy toward Taiwan remains one of maintaining stability, which suits both American and Chinese interests. With so many bright spots in U.S.-China relations on political, social, and economic fronts, what accounts for the chilly atmosphere that prevails between Beijing and Washington? The answer is straightforward. Relations between the U.S. and China have been awkward, even strained, because of a subtle but marked change in attitudes on the part of both countries. The U.S. finds China’s conduct in international affairs to be increasingly menacing, and as the Chinese government becomes more self-confident and starts to “play the game” by its own rules, it is less inclined to cooperate with the United States. To put it another way, as China grows more assured of its own superiority, it feels less beholden to the U.S. This has given Americans the impression that, since the end of the Cold War, China has been trying to elbow America aside, taking advantage of the U.S.’s inward-looking foreign policy to take its place on the global stage. Meanwhile, many Chinese believe that the U.S. is trying to hem China in just as their nation is starting to grow strong, using maritime territorial disputes with neighboring countries to weave a net that will contain China. Though the U.S. claims not to be taking sides in these disputes, when it comes to actual policy it is clear that the U.S. has adopted an oppositional stance, siding with all the other countries against China. During Obama’s spring 2014 visit to Japan, he made it clear that the U.S.-Japan alliance extends to the Spratly Islands, and in a White House press conference with the Japanese prime minister on April 28, 2015, he told reporters that China is using its muscles against neighboring countries. From China’s perspective, it does not look like the U.S. is playing the role of neutral protector of security in the Asia-Pacific region, but rather taking advantage of China’s unresolved territorial disputes to stir up anti-Chinese sentiment and isolate it as much as possible. For almost all countries in the region, China’s development remains the elephant in the room. Just grumbling about China and regarding it with hostility is by no means the rational choice. The enmity between China and the U.S. stems from quiet but significant changes in the relationship between the two countries that have occurred over the past twenty years. Since the mid-90s, the China-U.S. relationship has been one of strategic accommodation around a set of core interests. The Chinese government clearly defined these interests, which the U.S. needed to steer clear of, including Taiwan, Tibet, and Xinjiang; as long as these hot-button issues were handled well, the U.S. and China could see eye to eye. But recently some old core interests, like Taiwan, have become less pressing, while new ones in the areas of sovereignty, security, and development have been constantly cropping up. Two new issues in particular have heightened Sino-U.S. tensions under China’s widened definition of its own core interests. The first is the rise of Chinese power, particularly military power. The second has to do with the distinctive character of China’s new leadership. On the thorny issue of China’s maritime territorial disputes, Chinese leaders have dropped their low-key, conciliatory manner in favor of handling the problem on their own terms, and on the whole China’s international conduct and diplomatic discourse have become more markedly “Chinese.” As a result, the focus of the Sino-U.S. relationship has shifted from “core interests” to “regional strategic competition,” away from the traditional bilateral sphere and toward regional and global security issues. These are the so-called “third party factors” spoken of in the Chinese media. Scholars and policymakers on both sides of the Pacific are not prepared to handle this change, and they lack a long-term strategy. Neither side wants to see the two nations confront each other, yet the Chinese land reclamation projects in the Spratly Islands have become the most hotly debated security issue in China-U.S. relations. The South China Sea territorial dispute has gone beyond traditional issues of sovereignty and maritime borders, and is now dangerously close to becoming the primary battleground in the regional strategic competition between China, the U.S., and other East Asian powers, including Japan. In the area of cybersecurity, China and the U.S. ought to take the lead in cooperating to set up a mechanism for supervising international cyberspace. But because Beijing and Washington both lack the political will to negotiate cyberspace security regulations, the Internet is swiftly becoming a new area where China and the U.S. find themselves in competition. The government and social elites of both countries need to recognize this change in the Sino-U.S. relationship and come up with an effective long-term strategy. For almost all countries in the region, China’s development remains the elephant in the room. Just grumbling about China and regarding it with hostility is by no means the rational choice. With China’s increased stature, any small action can have large consequences. Take island construction in the South China Sea, for instance. It takes a country like Vietnam or the Philippines five to ten years to build up a reef or construct an airport. But in just two years’ time, China can build between five and seven islands and several runways. Condemning these actions as “militarizing the South China Sea” or “changing the status quo in the South China Sea” is a gross exaggeration. We are not seeing any substantive changes in China’s grand strategy. For the next twenty years, China will remain an “inward-looking” great power. The ongoing transformation of China’s internal politics, society, and economy will continue to be the limiting factor in China’s strategy toward the outside world. Moreover, the gap between Chinese and U.S. power has not changed fundamentally, either. When it comes to strategic power, the U.S. still has the upper hand. And with the revision of Japan’s constitution, the expansion of its military, and its more active role in security issues, the U.S.-Japanese alliance will be a powerful counterweight to China, capable of continuing to offset China’s rising power. America has no need to fear China, but it ought to respect China. Now that China has more weight to throw around, having China play a more active role in regional and global affairs and pursue its own rational interests in a way that both conforms to the logic of post-World War II East Asia and accords with international norms, is the new common ground for China-U.S. relations. The Sino-U.S. relationship, one of both cooperation and competition, will still decide the future of humanity in the 21st century. China does not need to challenge the U.S. strategically; it is in China’s interest to help the U.S. play its leadership role elegantly in the Asia-Pacific region and in the world at large. To help the China-U.S. relationship develop in a positive direction, both Beijing and Washington need to stay coolheaded and avoid condemning, suspecting, and blaming each other in an overly emotional manner. Only this way can we guarantee a future in which China and the U.S. enjoy a rational, cooperative relationship. BugsBunnyYourUncle: Mainstream opinion here is that China has the promise of becoming a great nation but the U.S. is constantly getting in the way. Chinese people are accustomed to didactic education and have a hard time accepting constructive criticism. The self-image that our civilization has inculcated over 5000 years makes Chinese people see critical voices from outside as “unfairly meddling in internal politics,” and not be kindly disposed towards those opinions. The majority of Chinese think that our economic development has put us one step away from becoming a great power, but few people recognize that in order for China to be respected as a great nation, we need to be able to take criticism! data_analyst: Warren Buffet believes that the U.S.-China relationship will be the most crucial bilateral relationship in the future. But the harsh reality is that for America, attacking China is a key method of increasing its energy as it emerges from the bottom of its economic cycle. As the internal report “Policy Trends After the 18th Party Congress and the U.S. Presidential Election” shows, China is the U.S.’s adversary, not its partner. This will only become more apparent going forward. FTNZ101: It's a not a question of a change in mentality. The U.S. is an extremely pragmatic country, and defending its own interests is its first priority. It’s also extremely active [in foreign affairs] and can’t tolerate any competition or harm to its interests in other countries or regions, no matter whether those interests are ethical and rational. Iraq, Libya, the Eurozone, Russia, and Iran are all glaring examples. Only nations with real economic and military clout can coexist peacefully with the United States. It’s obvious from the way the U.S. throws its military power around. VulcanPoplar: The core of the new great-power relationship that China wants to establish with the United States is equality. But the U.S.’s expectations about what this relationship implies are transparent. Right now, there’s obviously a large gap between reality and expectation. Yangjin-CASS: The U.S.-China relationship is the main spoke in China’s relationships with the great powers of the world. Developments in U.S.-China relations directly affect Chinese foreign policy and strategy. At the same time, U.S.-China relations can directly shape the landscape of international politics. Changes in the U.S.-China relationship during the Cold War had a profound effect on the balance of power in the world, and they continue to affect the whole world in the post-Cold War era. In the future, the importance and complexity of this relationship will become more and more obvious. HONGHSU: With the U.S. feeling threatened by China’s advance, and Americans, particularly China scholars, always wringing their hands about it, U.S.-China relations can’t possibly improve.